Last summer, Marvel's premier super family finally made the jump to the big screen. 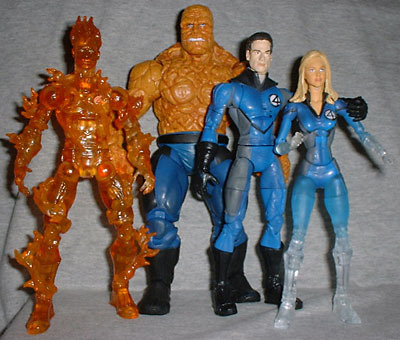 The Fantastic Four film was good (not excellent, but not at all bad, either), and if you wanted to build a complete movie-based FF, you had lots of options. We've been trying to narrow that down, helping you build the best possible team, with this Reed, this Sue and, uh, one of these two Johnnys. That's cool, but there was still one thing missing: one Thing. 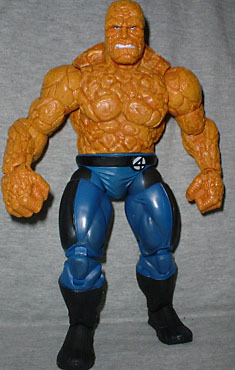 The Series 1 Stomp N' Clobber Thing looked nice enough, but his sound features took away a bit of articulation. Same with the next three releases - they all sacrificed playability for play features. Finally, however, we've got a figure of Ben that's worthy of standing beside his friends. The sculpt is really nice. Michael Chiklis was the one who convinced the producers that the Thing should be a guy in a suit, rather than a digital creation, and that physical presence definitely helped sell one of the film's more unbelievable characters - if he'd been CGI, we'd probably be hearing the same dumb complaints about Ben that we heard about the Hulk. 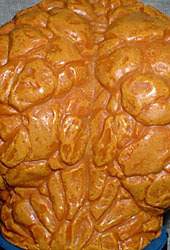 In any case, the comic-based Thing figures have always seemed fairly smooth, like orange concrete with etched-in lines. In the movie, Thing really was a walking pile of rubble, with an uneven surface, and that's what ToyBiz delivered for this figure. Just one thing: if Ben's chest and arms are so uneven, why are his legs still so perfectly anatomical, as evidenced by the tight fight of his uniform? Shouldn't it be less obvious that those muscle shapes are under there? Meh. Anyway. The sculpt is accentuated by the paint apps. The rocks are orange, of course, but they're not outlined harshly - there's a brown wash over the whole thing to bring out the shadowed areas and the texture of the stones. Ben doesn't look like a drawing or a painting, but like a man made of rocks, and that's due in part to the paint. His blue eyes are tucked away under his heavy brows, and there's no spillage between the white of his teeth and the orange of his lips. The two-tone blue of his pants matches the rest of the team well. Raging Thing has a bit less articulation than some of the others in previous series, but he also doesn't have any action features mucking it up. He moves at the neck, shoulders, biceps, elbows, wrists, waist, hips, thighs, knees, ankles and toes. It's surprising that he doesn't have a chest joint, boot tops or something between his elbows and wrists to provide a twist, but none of those points are a deal-breaker. He's got 22 points, which seems low for a ToyBiz figure these days, but still puts him on par with the early Marvel Legends. 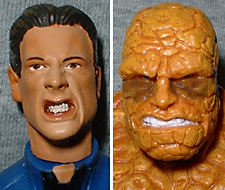 Raging Thing is taken from the scene in the film where Ben, fed up with being stuck in his stony body, gets in a fight with Reed, so his only accessory is from that part. No, it's not a breakaway lab table or something like that: it's Reed! In case you didn't already buy the Mr. Fantastic we recommended, this figure's a two-fer. AccessoReed has one point of articulation, at his neck. The rest of his body is soft rubber over a flexible wire, for maximum flexibility. You can wrap him around Ben however you like, but the wire inside feels really thin. I've never had one of those flexible pieces snap before, but this one feels like it'll needs some extra care. Reed is sculpted in a stretched out state, with everything but his head and shoulders elongated. He's painted well, though the grey hair on his temples seems rather haphazard. The face doesn't really look like Ioan Gruffudd, but it does seem like someone familiar. Can't place it, though. There was actually a running change in the paint apps with this set, and it's easiest to tell the versions apart by looking at Reed. If there's a swatch of skin tone painted below Reed's neck joint, then the shadows around Ben's eyes will be a lot darker. This wash was applied too heavily, so he ends up looking like he's got black makeup on. Remember, you want the version without any paint on Reed's neck - it's easy to spot in the package, so look before you buy. Now that Raging Thing is out, he's the version you'll want to buy, if you don't already have the Stomp N' Clobber version. It took quite a few months, but we finally have our complete Fantastic Four. Was the non-CGI route the right choice? Tell us on our message board, the Loafing Lounge.